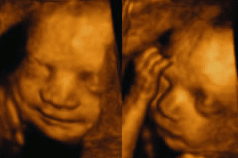 Who needs ultrasonic scans when you can have real 3D model of your unborn child (fetus) ? A resin-cast 3D print is one of the latest developments in the rapidly evolving field of 3D printing. Sadly, this new technology is not yet available in Bangkok. For now, potential parents need to travel to the clinic in Tokyo Japan. The new clinic developed this technology through a partnership with a 3D printing company named Fasotec to create what is jokingly referred to as “Shape of an Angel” or Tensi no Katachi. The 3D printer renders the 3D model in many different shapes and sizes that float in clear lucite material. The new service for anxious parents isnt cheap and costs abut 100,000 Japanese yen, or about $1,300 dollars. The cost of PGD in Bangkok will make this an attractive option for expecting parents. The secret to the device is a unique dual-resin extruder that is able to seamlessly join the babies image with the hardened amniotic fluid simultaneously. Parents can choose to have their babies 3D image captured for the entire body, or focus on specific body parts such as head. For those looking to share with the office staff, the 3D models are also made available as potable models or even cell phone charms. Would you like us to offer this new service in Bangkok Thailand? Let us know via email or comment below. To learn about PGD gender selection in Thailand Contact us.